I know many of you struggle to plan meals in advance. It can be a particular pain when the goal is to get as many nourishing meals into your body as possible...why does all the cheap, junky, processed food get to be so darn convenient? Even though I’m the type of person who reads cookbooks like novels and scours recipe-heavy web sites daily, up to this point I’ve not been one to plan meals in advance. My method was to walk into a grocery store, buy whatever I feel like/looks good and at the last minute decide what I’m going to cook. There are merits to this method, among them: being inspired by what’s in season or looks best at the market, and enforcing creativity and innovation in the kitchen. But to tell you the truth, neglecting to plan meals in advance and leaving the decision everyday to the last minute was becoming more of a chore than a pleasure. Then there were ingredients that would go to waste before I had defined a purpose for them. I also found myself buying a lot of the same ingredients over and over, doing the same familiar things with them and getting bored with my meals. Add to all that the guilt I felt from ignoring my lovely collection of cookbooks and hardly ever using them to plan meals. I’ll be the first to admit, it’s so much easier to Google a recipe online than go leafing through cookbooks when you just want your supper as quickly as possible. Each week I elect a “cookbook in residence” from which I choose recipes to plan meals for the next 7 days. One day in the week, I sit down with the chosen cookbook and select 2 breakfast recipes, 2 lunch recipes and 3 dinner recipes from its pages. Next, I make a shopping list then choose a date to go shopping. The recipes and their page numbers are written in my daily planner for easy reference, the cookbook goes to live in a permanent, prominent spot in my kitchen for the week. I make enough of each meal to feed me 2 or 3 days so I’m not cooking from scratch everyday. Last week my “cookbook in residence” was A Modern Way to Eat by Anna Jones. I already loved this cookbook so I knew I was in good hands. If you have access to this book (don’t forget to check your public library) I invite you to try these recipes. If that’s not an option, I’ve conceded to the convenience of good ol’Google and pasted links of a few similar recipes below. Do you have a good strategy to help you plan meals? Tell me about it below! I love this idea, as I am always standing in front of the vegetable display looking for something that speaks to me on that particular day! Sometimes I am lucky enough to have a bunch of bright green asparagus, a head of dark spring cabbage or some beautiful autumn squash and then it’s easy to be inspired but other times, especially in the middle of winter when less is growing, it’s harder to find the same motivation. I’m going to give this a try, thanks! Thanks, Rachel! 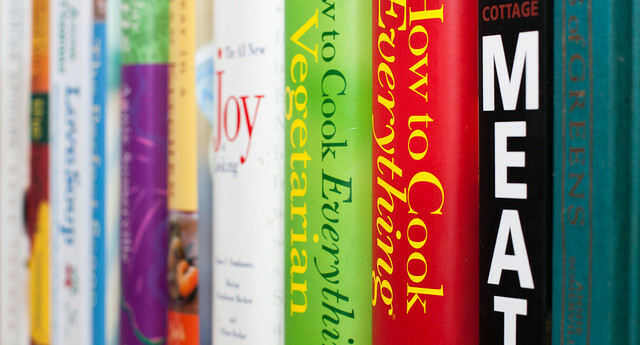 I’ve found meal planning like this immensely helpful…especially when there’s no beautiful produce to inspire/anchor the meal.I imagine you have quite an impressive cookbook collection to turn to!